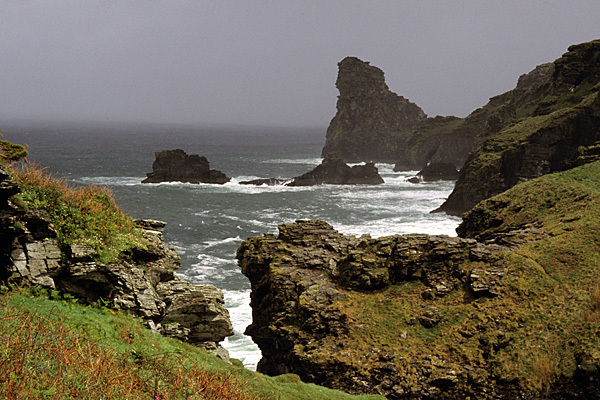 Stormy seas batter the mouth of the Rocky Valley on the North Cornwall coast. Rock stacks fill the sea at Kynance Cove near Lizard Point in South Cornwall. The rock arch of Durdle Door on the Dorset Coast is a popular visitor attraction. The South West Coast Path is Britain's longest National Trail, stretching along the coast of Somerset, North Devon, Cornwall, South Devon and Dorset. It measures a staggering 1014km (630 miles) and takes in rugged cliff coasts, rocky coves, sandy beaches, fishing ports and smuggling havens. The route starts in the Exmoor National Park and for much of the distance it runs through designated AONBs. Many parts are also designated Heritage Coast and towards the end comes the Jurassic Coast World Heritage Site. With all this interest and protection, it has to be good! This route was walked in a four-week period while researching The National Trails of Britain & Ireland. It was walked again over a six-week period to complete all the route research for this book. Cicerone originally covered the route in a two-volume guide, and the task on this occasion was to fit the entire route into one volume. Walkers approach the coast path in a variety of ways. Some are content to chip away for years, completing the distance in a series of half-day and one-day walks. Others take a week or a fortnight to cover long stretches of the coast, returning over a period of years to cover the distance. 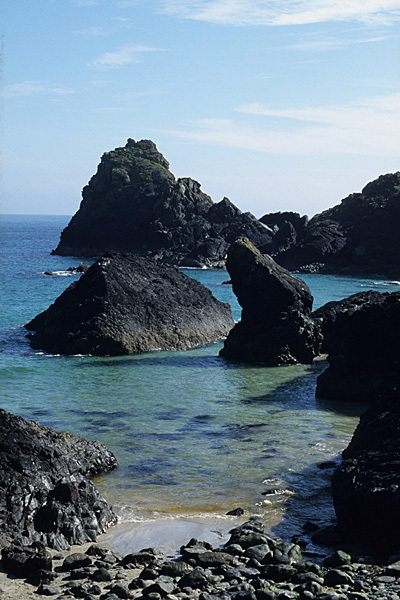 A few aim to tackle the South West Coast Path in a single journey, which requires careful planning and a measure of dedication. The route is best covered in the summer months, when all the ferries are running across the many tidal inlets, particularly on the south coast. However, that can be a difficult time to secure accommodation for one-night stopovers. In the guidebook, the route is split into 45 one-day walks (plus the 'South Dorset Ridgeway' avoiding Weymouth and the Isle of Portland). Given a couple of rest days, the route fits nicely into a seven-week period. The establishment of a continuous coastal path has taken decades to achieve and ongoing work and negotiation ensure that the route is continually improved. The publication of this book coincided with the 25th Anniversary of the South West Coast Path, and the book includes OS Landranger mapping, with the route highlighted from start to finish. It has proved to be a remarkably successful book, being reprinted with updates on average every year. For the second edition, the route was completely re-walked, with the route description overhauled, facilities checked, and the mapping fine-tuned using GPS tracks. In addition, three detailed map booklets are available to accompany the guidebook. These all contain 1:25,000 Ordance Survey maps, covering the route as follows: Volume 1 Minehead to St Ives, Volume 2 St Ives to Plymouth and Volume 3 Plymouth to Poole.